In honor of Jodie Meek's unreal 54 point performance last night, we are proud to present to you the very standard, yet always eye-pleasing, Kentucky Waterfall mullet. I can only speculate as to his location at the time of the picture, but rest assured that my imagination is running rampant and as a result, a smile is firmly planted on my face. 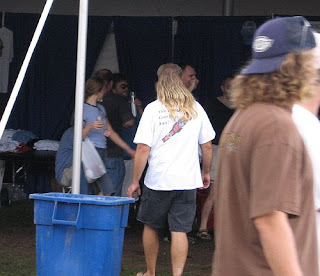 Happy Mullet Wednesday to all! Tennessee somehow scrapped to within seven at 71-64 with less than six minutes to play. That's when Gillispie went back to his SLOB (sideline out-of-bounds) and BLOB (baseline out-of-bounds) playbook, which paid dividends all night. He called a play for Meeks, who responded by draining a baseline 3-pointer. We currently possess the second longest home-court winning streak in the nation, at 34 games. Notre Dame is at 45. Their next home game is on the 24th against UConn. After that, they have capable visitors in (possibly) Marquette, Louisville & Villanova. This is of no importance whatsoever, obviously, but something to watch. While we're still talking basketball, Boo Radley, over at Atomic Teeth posted a very good piece on why Mike Anderson is not the right guy for the job at Missouri. As you might imagine, his main argument is the Anderson's "Forty Minutes of heck" style is not suited to win in the Big XII – or basically any time you don't have vastly superior athletes. You'll get no argument from me. Keeping with Atomic Teeth, Phenomenal Smith also put together a good piece recently. His piece examines the bowl results of not only the Big XII, but the rest of the country as well. Especially appreciated is his ability to look a bit beyond a simple win and loss. Yes, the Pac 10 was 5-0 and proud we are of all of them. But it helps to take a more detailed gander every once in a while. By no means is getting five of the best 125 players in Texas any incredible accomplishment setting us apart as a program for years to come, but it's a step. And when you mix that talent with the JUCO commits we've received and the talent from the rest of the country, it's quite obvious that Mangino and his staff are putting together far and away the best class (on paper) since his arrival in Lawrence. Sherron Collins: A-. Foul problems (though one was a truly horrendous call), four turnovers, and a couple defensive lapses detract from on otherwise great performance. He was extremely efficient in getting 24 points on only 11 shots, while also collecting 5 boards and dishing out 4 assists. Cole Aldrich: B+. Hard to get too upset when he only misses one shot and scores 15 points. But the six shots weren’t nearly enough (not necessarily his fault), especially in a game he should have dominated. I also would have expected more than 8 rebounds from him; though he did lose some minutes to some second half foul trouble (after not picking up a single one in the first). Again though, took care of the ball, was very efficient scoring and altered several shots, blocking two – hard to complain, but not his best game. Tyshawn Taylor: A-. Was good on defense and great on offense, especially in the way he let the game come to him and took what the defense gave him. Like those already listed, he was very efficient in his scoring, racking up 20 points on only 8 shots. Factor in his 4 boards, three assists, 2 steals and block and that may have been his best all around game. Very Chalmers-like box score. Brady Morningstar: B-. Didn’t look like himself all night offensively, but when it came down to it he hit the biggest shot of the night and then added a second triple a few minutes later. Generally played good defense as he’s become known to do, but didn’t collect a single rebound – out of position or not, that can’t happen from our starting wing. We’ll take 3 assists to 0 turnovers every time out though. Mario Little: B. Still kind of guessing with him as the 13 minutes he played last night were a season high so we don’t know much yet. I think last night gave us an idea though as we saw some stuff from him offensively that we haven’t seen from anyone else on the roster. Added three boards and a block to his 8 points – hopefully a sign of good things to come. Tyrel Reed: C+. I thought his defense, especially in the first half, was better than we’ve come to expect. But we need him to stretch the defense when he’s in and he just didn’t do much of that last night. Missed both threes, had 2 layups and was just 2-4 from the line for 6 total points. Great steal and finish to make it 18-0 early on, but we need more out of him. Marcus Morris: B-. 7 boards and 2 steals in only 15 minutes is fantastic. But we need to be getting more than 3 points and 15 minutes out of him. He also needs to learn how to shoot free throws. Since he actually wasn’t in foul trouble, I’m guessing Bill was pretty displeased with his practice of late – also his defense wasn’t exactly stout, though not terrible either. Markieff Morris: B-. I’m starting to like what he gives us, sans the fouls. He’s still not boxing out, but did come up with 5 boards to go along with 5 points, 1 block and assist. If we can get him to just move his feet and quit using his hands on defense, I think he fits in well at the four with his passing ability. All joking aside, good work and to paraphrase Dennis Green, Tennessee is not who we thought they were.